It's 8pm on a Thursday in Dubai. I am running the last half marathon of the season tomorrow morning at 6.30am. Everything is laid out, including the banana that I will force myself to eat before the race. I am still arguing with myself at what time I should wake up for this. I had a box of little chocolate pralines in my race goodie bag. I haven't had those kind of things for ages. My sugar-reduced lifestyle has been going on for long enough that I am by now happy with 85% dark chocolate. I admit, on bad days, I can eat a whole 100g/4oz bar of it. I have never had one decent and healthy food item in a race goodie bag. It ranged from spaghetti to chocolate cookies and dodgy "energy" drinks. If you have all or just any of those, the race might become a true challenge. So I should actually stick to what I usually eat. That's the usual advice: before a race, do what you do before a training run. Alright, a whole bar of dark chocolate might not be the best idea now. Something sweet would be nice though. Or some roasted pepitas, that would be the savory option. 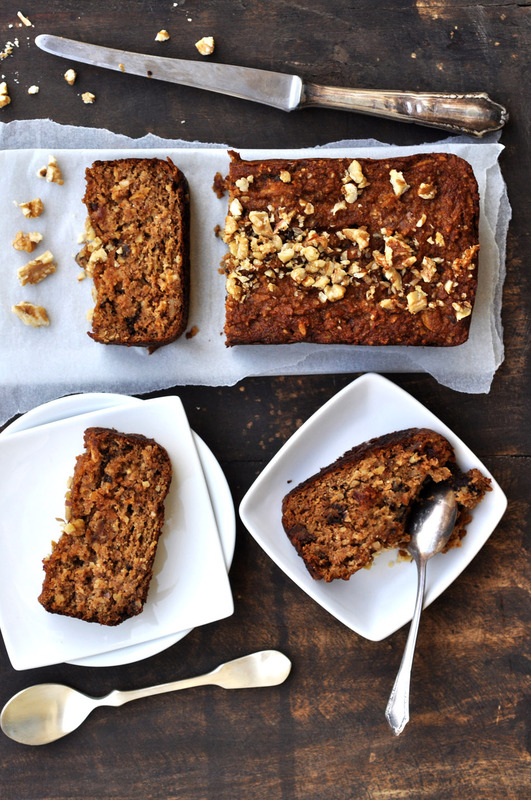 This apple cake is actually a lazy recipe because I simply changed the fruit of the Grain Free Banana Date Bread. A fellow Dubai blogger was asking me after I posted the banana bread recipe, if one could somehow substitute the banana. Apples, I said. Why didn't it cross my mind before? Honestly, I'd always prefer apples over bananas myself. I added a little more dates and date syrup to the apple cake, as apples are naturally not as sweet as bananas. The result: a moist and apple-fresh cake with a lovely nut crunch.